The function_score query wraps the main query and the function we would like to apply. The main query is executed first. The field_value_factor function is applied to every document matching the main query. 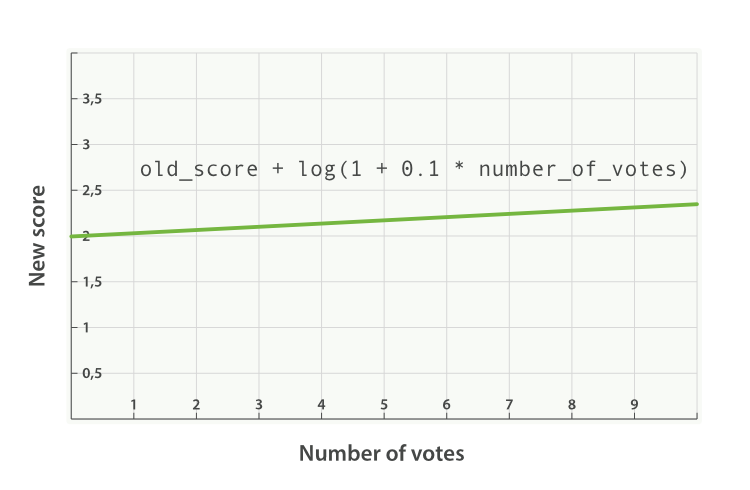 Every document must have a number in the votes field for the function_score to work. This will not give us great results. The full-text _score range usually falls somewhere between 0 and 10. 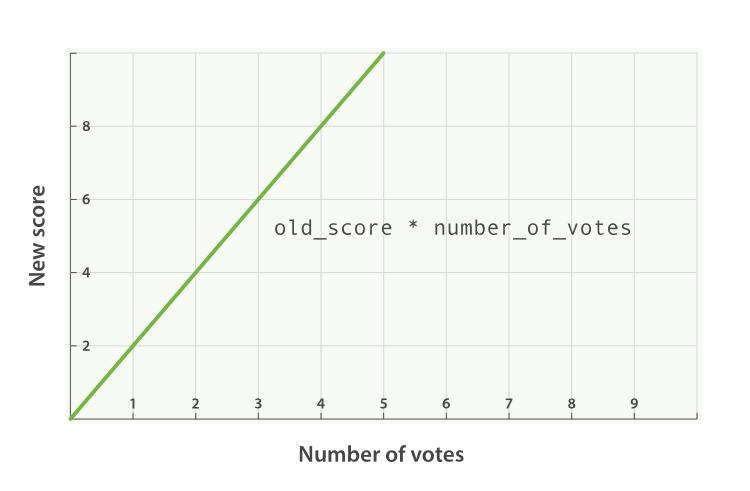 As can be seen in Figure 29, “Linear popularity based on an original _score of 2.0”, a blog post with 10 votes will completely swamp the effect of the full-text score, and a blog post with 0 votes will reset the score to zero. 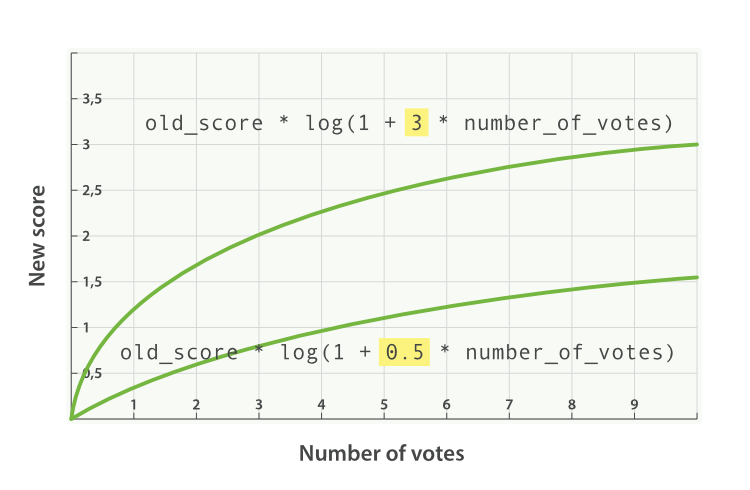 A better way to incorporate popularity is to smooth out the votes value with some modifier. In other words, we want the first few votes to count a lot, but for each subsequent vote to count less. The difference between 0 votes and 1 vote should be much bigger than the difference between 10 votes and 11 votes. 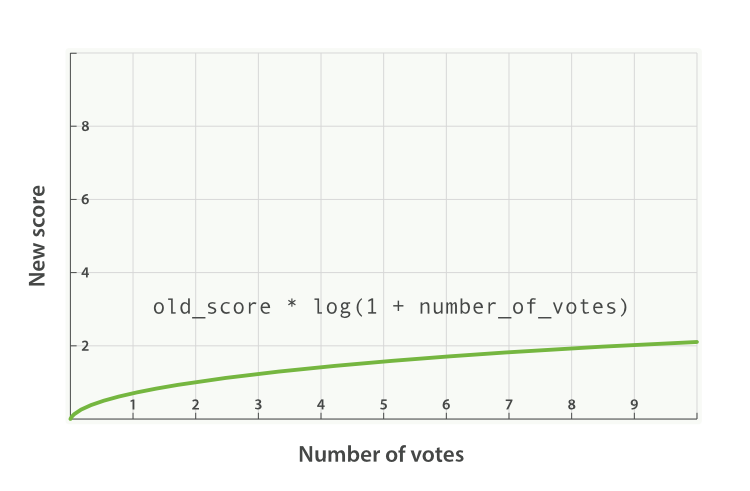 The log function smooths out the effect of the votes field to provide a curve like the one in Figure 30, “Logarithmic popularity based on an original _score of 2.0”. Set the modifier to log1p. The available modifiers are none (the default), log, log1p, log2p, ln, ln1p, ln2p, square, sqrt, and reciprocal. You can read more about them in the field_value_factor documentation. A factor greater than 1 increases the effect, and a factor less than 1 decreases the effect, as shown in Figure 31, “Logarithmic popularity with different factors”. Add the function result to the _score. Whatever the result of the field_value_factor function, it will never be greater than 1.5. The max_boost applies a limit to the result of the function only, not to the final _score.